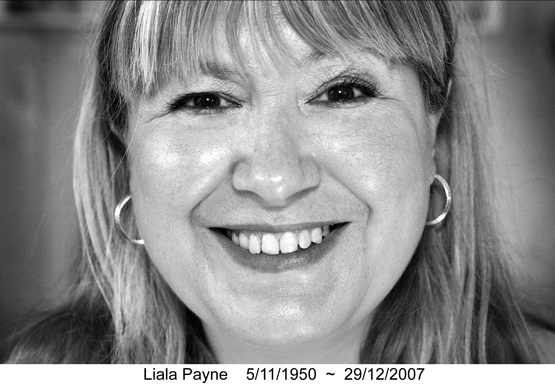 Liala Payne was also the Mother of my Brother Daniel and the Daughter of my Italian Grandmother, Ofelia. I guess I am writing it down to clear my head. Perhaps it will be cathartic. Maybe I am finding any opportunity to distract myself. At 2:20am as we lay exhausted in our beds after many many bedside hours, she was breathing her last breath. She lay in a hospital in the center of England. She did not die alone. By her side, Nigel, her partner of 12 years who had shown a superhuman strength in staying with her continuously over the last week. Although suffering many different ailments it was pneumonia that was taking her away from us. The first hint i had got that she was not well was almost two months ago on the morning of her 57th birthday. I had arrived with presents and a card and could see she was not well. She never complained and avoided doctors when she could. As a result, a bruise she suffered in a fall had gotten infected and started to spread inside her chest. The doctor we called didn’t see it and when we finally persuaded her to go into hospital it had already taken hold. It grew swiftly and silently until only the most powerful of antibiotics could slow it down. By it was too late. There were many goodbyes. But as each doctor gave us a different prognosis, there were days where we still thought, we still hoped she would pull through. On Christmas Eve we kept to European tradition and she opened her presents in a public ward. At 1am Christmas morning my first gift was a call from the hospital informing me of an imminent procedure that was about to take place that she may not survive. Later that day she was moved into a room so she could ‘have more privacy’. For me that was the point I knew. But I didn’t want to believe. The day before yesterday we were told in great detail that she would not last the night. She did. She was unconscious for most of the following day and every moment a breath passed we were certain it was her last. Both me and my Brother both found the counting of breaths unbearable. Waiting for a moment we never wanted to arrive. From dread to fear and back again, all the time our hearts pounding, aching and on the verge of beating right out of our chests. We needed sleep and left our sleeping mother lifting and falling behind her oxygen mask. We got to mine and the phone rang saying that my Mother had opened her eyes. The hour drive back was the worst drive of my life. We did not know what to think. I am so very glad we got there when we did. My mother had made one of those miraculous but albeit brief recoveries you hear about and we managed more goodbyes. words which had to be said. We’d been given another chance to tell her how much we loved her and through movements and hand clasps, She too got the chance to communicate. It was a last momentary reprieve from the edge of death. Exhausted and deeply saddened by the final realisation we were saying goodbye for the very last time, we choose our words carefully. We gazed into her eyes and she gazed back until this last miraculous bout of awareness seemed to flutter and wane. This was the point me and Daniel decided she was waiting for us to leave so she could let go. I have always thought mourning to be the selfish act of someone who could not let go. Someone who found it hard dealing with loss and bereavement. I am thinking now it is more natural than that. An inbuilt mechanism to stop your heart from exploding with grief and pain. I am mourning now and I imagine a part of me always will. It will be a smaller part than the one that remembers her love and cherishes the memory of every moment spent in her company. She’s my Mum. I owe her my life. I hope I made her proud. I hope I earn her gift.. my life. I just found this page from one of your links…oh man, Christian I’m so sorry to hear this 🙁 I cried reading this, it’s so honestly and sensitively written. I can’t imagine what you went through, although I lost my beloved nanna a few years prior and it was the most awful pain. I unfortunately couldn’t put the words together to say anything at the funeral or write anything like this. I was just numb, and didn’t know how to handle things. My mother turns 50 in 2 weeks and my siblings and I have been busy making plans to send her to New York to visit an old friend. She’s been pretty ill for a few months, thankfully picking up so she can make the trip, and it’s all just made me appreciate what we’ve got. What you wrote about your grandmother and twitter also made me think – you’re obviously very close to your family and it’s lovely that you’re able to share it with ‘outsiders’ like myself. Your son will grow up being able to see and access all this fantastic information, and learn about his family and so much about his father. And of course about Liala too. It’s wonderful to have that to look back upon, I think.